Carowinds, a Charlotte North Carolina amusement park, unveiled its new, all steel super coaster this week. The 32-passenger train climbs to the top of a 325 foot hill which is followed by an 81 degree first drop, the train screaming through a series of hills, curves and quick transitions while reaching speeds of up to 95 miles per hour....WOW..What a Rush !! Every theme park today seems bent on outdoing its competitors in the roller coaster field, which is nothing new. Even as this article is being written, I'll bet there is ANOTHER bigger, faster coaster under secret construction somewhere in America. Americans do love their roller coasters and it been a long lasting love affair. 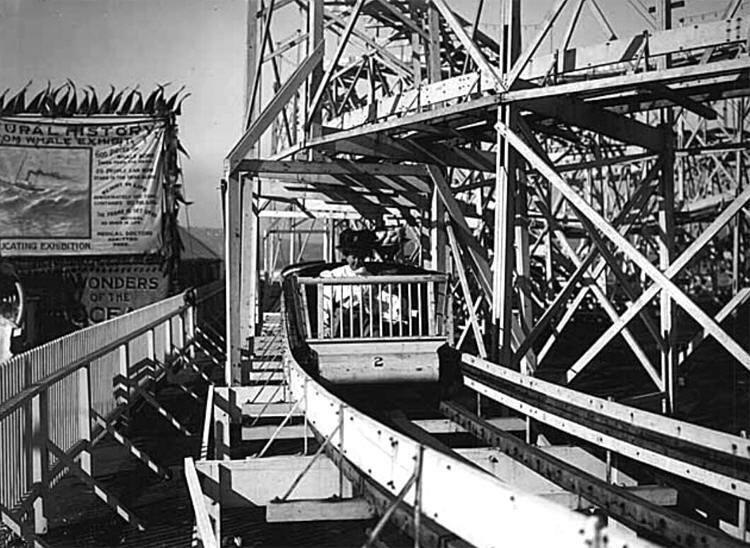 In 1884, the first roller coaster in America opened at Coney Island, in Brooklyn, New York. Known as a Switchback Railway, it was the brainchild of La-Marcus Thompson. The ride blazed along at six miles per hour and cost a whole nickel for a ticket. This new form of entertainment was an instant success and by the turn of the century there were hundreds of wooden roller coasters around the country, each one being built bigger and faster than its predecessor. In this early 1900's photo two ladies in Victorian dress try vainly to keep their large, plume hats firmly on their heads on an early wooden roller coaster.